Due to the fragile nature of the park’s resources, only 70 people can enter the self-guided area at one time. We reach that limit regularly from November through March and on weekends and holidays. Once that happens, no one can enter the area until other visitors leave. To avoid a wait, call (512) 389-8911 to reserve a day for your visit. 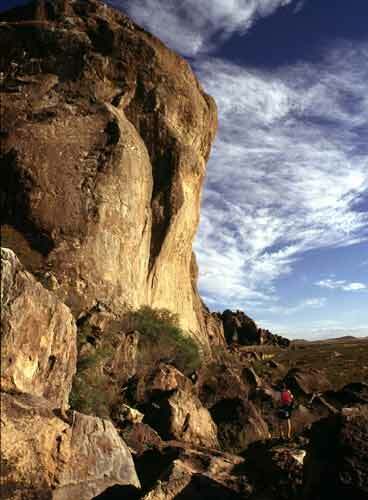 One of the best ways to explore Hueco Tanks is on a tour. Your guide will show you the area, answer your questions, and explain the park’s natural and cultural history. You can only access West Mountain, East Mountain and East Spur with a tour guide. Request tours for Wednesdays through Sundays throughout the year by calling (915) 849-6684 before your visit. Due to staff time constraints, tours are only given if requested early enough to confirm a guide. Early visitors left images on the rocks at Hueco Tanks. The images connect us to the mystery, ceremony and conflict of at least three cultures and more than 1,500 years. Visit our History page to learn more. See images in the self-guided area or on a guided tour. Call (512) 389-8911 to make a reservation to visit the self-guided area. To request a guided tour, call (915) 849-6684 before your visit. We offer three tours with different routes and difficulty. Tours are Wednesday through Sunday, if a guide is available. Don’t touch the pictographs or petroglyphs; oil from your skin can damage them. Avoid brushing against them with your clothes or belongings. Making rubbings from pictographs or petroglyphs, or adding marks to the walls, is vandalism. Comply with state and federal laws. These include Texas State Parks Regulations and the Texas Antiquities Code. Bring a camera, water and a pack to keep hands free while scrambling up or down rocks. Dress for the desert: sunblock, hat, hiking boots and the right clothes for the weather. Our campground has restrooms, hot showers and a dump station. For reservations, call (512) 389-8911. Reservations are limited to three days; you may be able to stay longer if a site is available. Site types: 50-amp water/electric or water only. No sewer at sites. Parking: Back-in only, single-vehicle width. Drive lengths vary from 35 to 70 feet. Two vehicles allowed at each site. Park extra vehicles in the overflow lot for $2 each. Camping check-in ends one hour before the park closes. There is no late entry. For site security, you may only leave the park after hours in case of emergency. No more than six people can camp at each site. Pitch tents only on tent pads. Cook only with camp stoves and containerized fuel. We do not allow charcoal or firewood, as ash from fires can damage the rock images. Public consumption of alcohol is not allowed. You must have a guide to explore the rocks and trail around the campground. Register daily at headquarters to hike and climb in the self-guided area. Experience world-class rock climbing at Hueco Tanks! Choose from self-guided or guided climbs. Remember, some areas of the park can only be accessed on a tour. Call (512) 389-8911 to make a reservation to climb in the self-guided area. Request a tour by calling (915) 849-6684 before your visit. Tours are Wednesday through Sunday, if a guide is available. 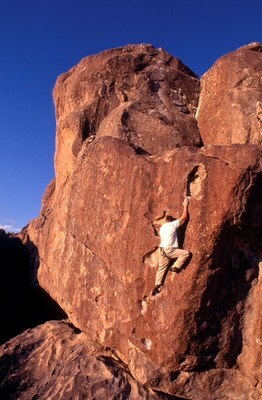 We do not provide climbing instruction or equipment. Bring your own equipment: climbing shoes, crash pads, chalk, food and water. Check our Closure List to know which areas are off limits. Hike in the self-guided or guided areas of the park. Call (512) 389-8911 to make a reservation to hike the self-guided area. 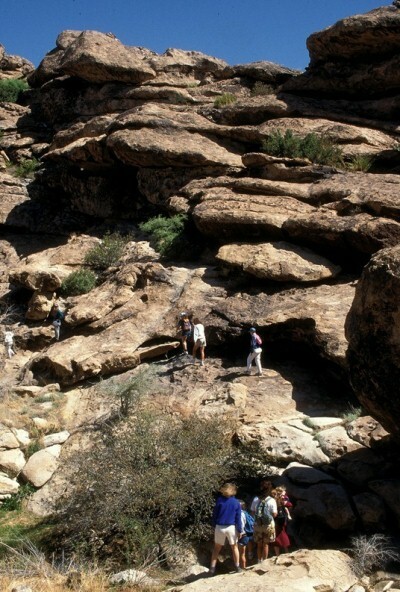 Call (915) 849-6684 before your visit to request a hiking tour. We schedule tours Wednesday through Sunday, if a guide is available. 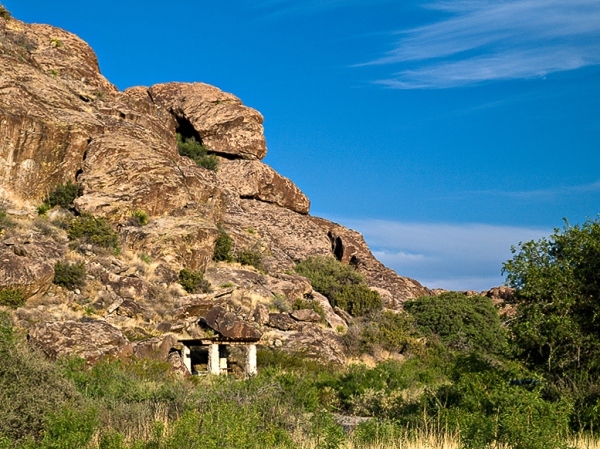 More than 200 species of birds have been sighted at Hueco Tanks. Look for birds in the self-guided area or on the monthly birding tour. Join our birding tour on the third Saturday of each month. Reservations are required; call (915) 849-6684. Bring binoculars, a camera and water. Stay on trails and respect wildlife’s space. Photo courtesy of John Chandler. The park has 10 picnic sites with shade shelters in the self-guided area. Some are wheelchair accessible, while others are tucked away in the rocks. Call (512) 389-8911 to make a reservation to picnic in the self-guided area. Cook with camp stoves using containerized fuel only. We do not allow charcoal or firewood, as ash from fires can damage the rock images.